I love when I can share a great experience at a restaurant with you. 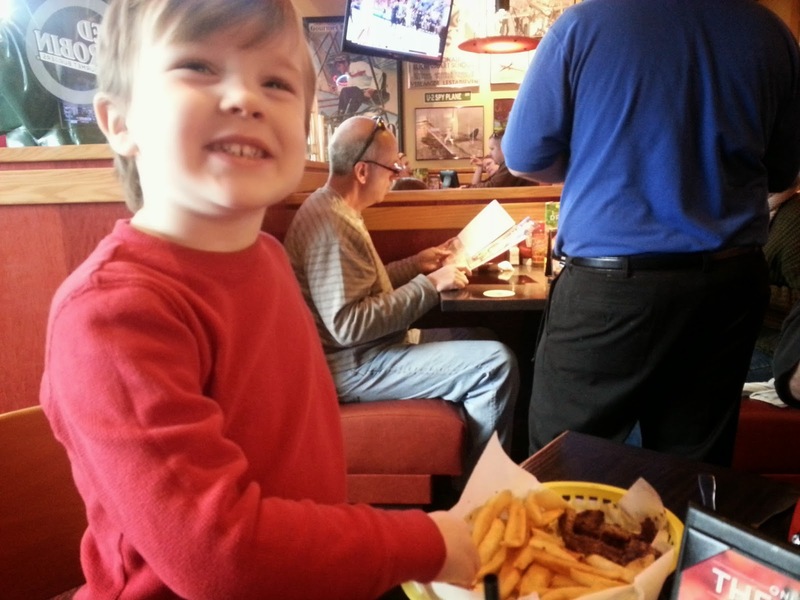 We went to Red Robin over the weekend, and it was the THIRD time we had a great experience eating there - which means they handled our food allergy requests like pros. Red Robin isn't known for it's unique culinary dishes of course (although their burgers are "award-winning"! 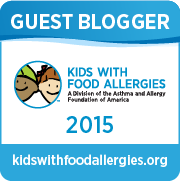 ), but it sure is a great place for families, kids and food allergies. Eating out at a restaurant has to be more of a calculated and researched decision for our family. Frankly, we have to make a conscious decision to take a little bit of a risk and trust in others to make safe food for your child with food allergies. I try to say a little prayer every time we go out, bring our chef card, be smart about communicating and ordering, and hope we do it all correctly. Many times, it's more about getting out of the house and the action of eating out (and eating out safely for Little Guy) than it is about the "culinary experience". Red Robin has a very accessible allergen menu online and printed at the restaurant. The past few times I've ordered a plain burger or chicken, steamed broccoli and fruit for little guy. I recently discovered that the french fries are made in a dedicated fryer in soybean oil. French fries of course aren't the healthiest option, but when you have limited food options at a restaurant, it's a treat to be able to eat them. He obviously liked his meal (sorry about the phone photo quality!). I also ordered a similar meal for Little Gal. She loves whatever we put in front of her and thankfully she will eat most things. 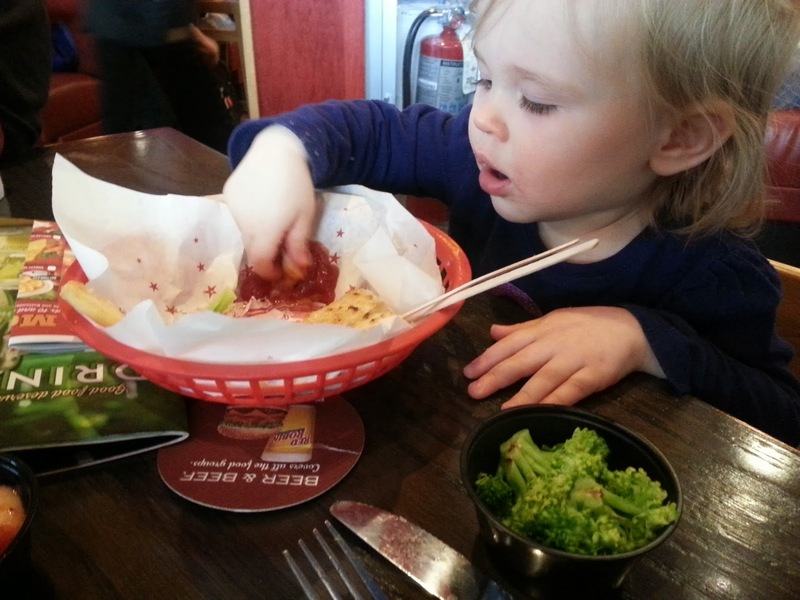 I like how Red Robin has a variety of healthy fruit and veggie based side dishes for kids. 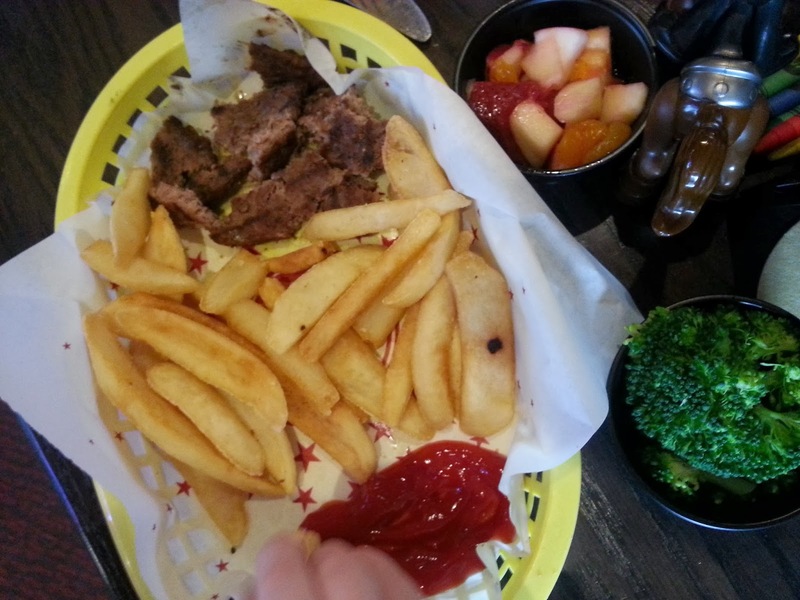 Thankfully, Little Guy usually eats his fruit and veggies, so he ate all of the burger, his fruit plus Little Gal's fruit that she didn't want, a little of his broccoli, and less than half of the fries (mama ate the rest - oops). Great burgers and fries, and bottomless fries too! Hey, fries aren't the healthiest choice, but treating ourselves every now and then is okay. The fact that Little Guy can EAT the fries since they're made in a dedicated fryer in soy oil only. Many times fries are off limits due to possible cross contamination in the fryer. Easy online payment system at your table - great for when it's busy, your kids are getting restless and you just want to get out of there! No waitstaff needed! Not much. My only complaint is the quality of the food. I'm so grateful to Red Robin that they've handled our food allergy requests so well. So, I do hate to even mention this! However, I could tell the broccoli was microwaved, and the chicken that both Little Gal and I ordered had a very rubbery quality to it. Precooked, frozen, and then recooked I'm guessing. 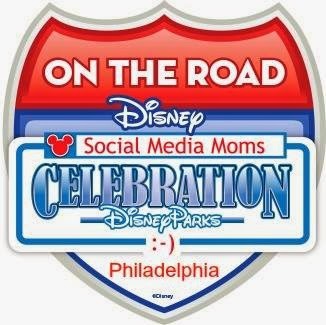 But as I mentioned before, going to Red Robin is more about the FAMILY EXPERIENCE and less about the CULINARY EXPERIENCE! PS - did you catch the Oscars last night? I watched a bit of it. Oh how I wish I could stay up to watch the whole show, and not pay for it the next day. It's one of my favorite nights of the year. I didn't make popcorn like I did last year, but the husband and I tied this year in our annual Oscar night competition. It's probably because we only saw ONE movie out of the whole Oscar bunch! By the way, even though American Hustle didn't win any Oscars, I highly recommend it for it's entertainment value, little bit of humor, and captivating story line without much violence. Loved it! This post was NOT sponsored by Red Robin. All opinions are my own! I remember when Red Robins first opened and taking the kids there, they loved it! Glad you found another restaurant you can all enjoy :) I got to watch about an hour of the Oscars this year and the best part that I saw was Bradley Cooper and Ellen taking a "selfie" of all that could get in the picture, that was pretty cool! but was that planned? pretty cool anyway.